The original Don’t Starve ($4.99) started a revolution of sorts in my house. My wife, who typically doesn’t enjoy punishing or permadeath games, took to it for weeks on end, and started a revolution of sorts in terms of her gaming habits. She’s spend days trying to perfect a certain run, learning new ways to survive in the process, die, and then have to start all over. We did it together all the way through two expansions, and although it’s not for everyone, the process of picking up on every little minute detail every playthrough and coming out stronger for it is incredible. 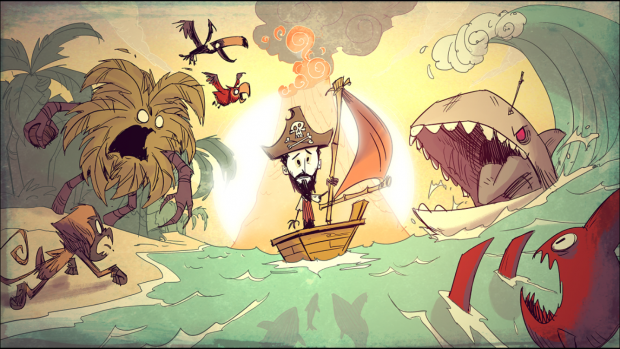 That second expansion has finally made its way to iOS in the form of Don’t Starve: Shipwrecked ($4.99), and although it’s one heck of a mixup in terms of the survival formula, it’s not without its iOS specific faults. Let’s start with the basics if you haven’t played Don’t Starve before. This is a survival joint through and through, tasking the player to live through an indefinite amount of days (or partake in the optional story) when literally everything in the world is out to get them. You can go crazy, starve, and die with an insanity, food, and health meter respectively, so basically anything and everything can go wrong. This is Murphy’s Law: The Game even more so than a lot of other survival experiences in an almost comical way. But as I kind of hinted at above, each time you dive into the shadowy world of Don’t Starve you come out a little stronger. Maybe instead of using all of your materials at once, you’ll save them for instances where new recipes come up, and craft something even more useful in the process. Or, you’ll know how to battle a specific type of enemy that crushed you before. It’s all part of the process, and although some of the esoteric type knowledge is better suited for a good old fashioned guide, you really can pick up on just about everything the game has to offer through intuition and experience. Shipwrecked is even more intense in the sense that you no longer have one massive landmass to explore, but a ton of little islands. Now you have to craft food, stay alive, and survive the night by building a light source on top of the added stress of knowing that somehow, someday, your island will run out of resources. Now it’s possible to eventually create your own renewable ones Gilligan’s Island style down the line, but in the early game and the early days of your time with the game, you’re going to scrape by, and probably die a lot. Now the iOS version isn’t as smooth as other editions, mostly because everything is so densely packed. Shipwrecked has a long load time — yes, I said “load time," because once you initially load it up, everything is good to go. But that load can take several minutes, and in some cases on certain devices, reportedly up to 10 minutes or more. Several glitches don’t help smooth over the performance issues, a few of which ended my run entirely. For a game like Don’t Starve you basically need a perfect, well-oiled machine — if a run ends because of something out of your control, it’s enough to make you want to quit. The other concern is the touch interface. While it worked to a degree with the original, this one, which adopts an additional touch-based control scheme, is really finicky. Sometimes when there’s so many items on-screen touching the one you want isn’t exactly feasible, even on an iPad. 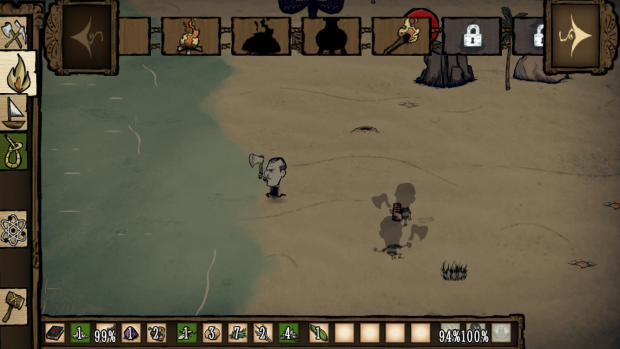 Now for construction or low key simulators that’s fine, but for a game like Don’t Starve where your life, and potentially a 20 hour playthrough is contingent on precision, it’s not a good feeling to suffer a death because the game registered some other location on-screen — or at least, slightly off center. There’s another negative here that’s intrinsically linked to the filing of the app — Shipwrecked is not an IAP purchase for the original game, but it’s own separate thing. It’s cumbersome to say the least, and although I’m sure technical issues precluded developer Klei from incorporating everything into one app, it’s not ideal to boot up two programs when you want to access different save files. 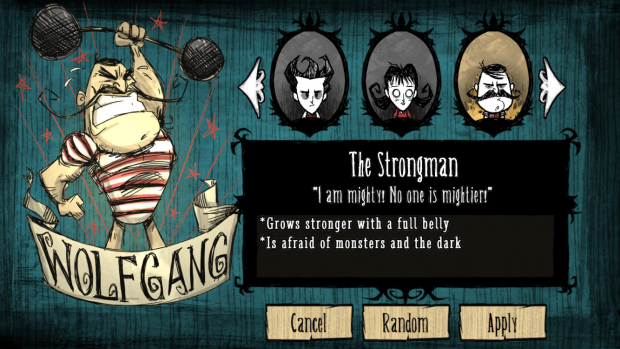 Still, Don’t Starve is a one of a kind experience that manages to marry survival mechanics that so many games have done before it, with a cartoonish, Tim Burton-esque charm. Once you’ve embarked upon a dozen runs or so the game runs like clockwork, and even the touch controls fall into place.